NOTICE: Requires the base game Borderlands 2 in order to play. Activation key must be used on a valid Steam account, requires internet connection. This content is part of the Season Pass and will be available to Season Pass purchasers in game upon release. ABOUT THE GAME Enter “Mr. 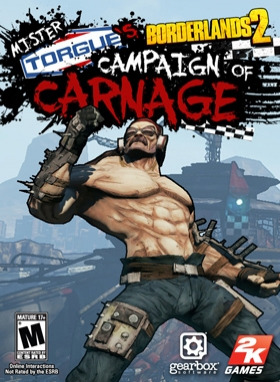 Torgue’s Campaign of Carnage” and see if you have what it takes to become champion of this brand new storyline … in Borderlands 2. Fight for the Big Loot against some of the baddest baddies in Pandora, including hordes of Biker Bandits. Plus, take special quests from Tiny Tina, Moxxi and others for extra rewards. And don’t forget to bring your friends -- those higher levels get pretty tough. KEY FEATURES More Badassitude: Immerse yourself in the Badass Crater of Badassitude and explore never-before-seen parts of Pandora. New Bosses and Enemies: Face off against hordes of new enemies and bosses including Pyro Pete, Motor Momma, Badassaurus Rex, and a blimp. More Characters: Raise havoc with the help of new characters like Piston and Mr. Torgue as well as returning favorites Tiny Tina, Sir Hammerlock, Mad Moxxi, and more! More Adventures, More Gear, and More Explosions: Explode your problems away with crazy new weapons as you fight your way through an all-new story with sidequests aplenty. New Battles: Get in a good old fashioned bar brawl, try to survive a death race, get your gladiator on, and more. SYSTEM REQUIREMENTS Minimum: OS: Windows XP SP3 Processor: 2.4 GHz Dual Core Processor Memory: 2 GB XP, 2 GB Vista Hard Drive: 13 GB free Video Memory: 256 MB Video Card: nVidia GeForce 8500 / ATI Radeon HD 2600 Sound Card: DirectX 9.0c Compatible Requires the base game Borderlands 2 in order to play. Recommended: OS: Windows XP SP3/Vista/Win 7 Processor: 2.3 GHz Quad Core Processor Memory: 2 GB Hard Drive: 20 GB free Video Memory: 512 MB Video Card: nVidia GeForce GTX 560 / ATI Radeon HD 5850 Sound Card: DirectX 9.0c Compatible	Other requirements & supports: Initial installation requires one-time internet connection for Steam authentication; software installations required (included with the game) include Steam Client, DirectX 9, Microsoft .NET 4 Framework, Visual C++ Redistributable 2005, Visual C++ Redistributable 2008, Visual C++ Redistributable 2010, and AMD CPU Drivers (XP Only/AMD Only)	© 2012 Gearbox Software, LLC. All rights reserved. Borderlands, Gearbox, and the Gearbox Software logos are registered trademarks, and the Borderlands logo is a trademark, all of Gearbox Software, LLC and are used here under license. Borderlands 2 is published and distributed by 2K Games, a subsidiary of Take-Two Interactive Software, Inc. 2K Games, Take-Two Interactive Software and their respective logos are trademarks and/or registered trademarks of Take-Two Interactive Software, Inc.